Cities in Norway come in a wide variety - visitors can enjoy everything from quiet, cozy towns to bustling metropolitan areas full of art and culture. Travel from city to city in Norway is easy with several transportation options, so you can pick more than one Norwegian city destination for your visit...let's find out which city in Norway suits you best. Topping our list of Norway's best cities for visitors is the picturesque city of Bergen. Bergen is one of Norway's most popular destinations for good reason, since Bergen isn't far away from Oslo, has a very scenic location on the west coast of Norway, and is one of the warmest cities in Norway in winter! The city of Oslo is Norway's capital, and should definitely be near (if not at) the top of your list. Here you will find a historic city dating back more than a thousand years. Today, Oslo is a bustling European metropolitan area that offers everything to keep a Norway visitor happy, fed, and entertained. You could spend weeks in Oslo without doing the same thing twice! Did you know Trondheim was Norway's first capital? Trondheim is a smaller city than the first two picks, and the quiet historical districts remind of old fairytales. Maybe it's this kind of atmosphere that makes it so special to visitors that want to take things slower and relax a bit more. Trondheim is especially beautiful in late summer and fall. Make sure to enjoy the fresh seafood available here and visit Nidaros Cathedral, the largest church in Northern Europe. Here's a city for the active traveler. Just remember that the city of Lillehammer doesn't only offer skiing! In the summer, there's fishing and hiking, the Maihaugen open-air museum, a water park, and a nice pedestrian area in the center of Lillehammer. In the winter, of course, this Norwegian city outdoes every other place, with winter sports, sleigh rides, a winterized amusement park, luge track, ski jump, and ice fishing. Last but not least, I want to make sure to mention the cozy town of Geiranger. Yes, it's a rather tourist-y destination, but for nature-loving travelers, the beauty of the Geirangerfjord surroundings easily trump that. If you can't stay long, consider Geiranger as a 1-2 day trip from one of the bigger cities in Norway. 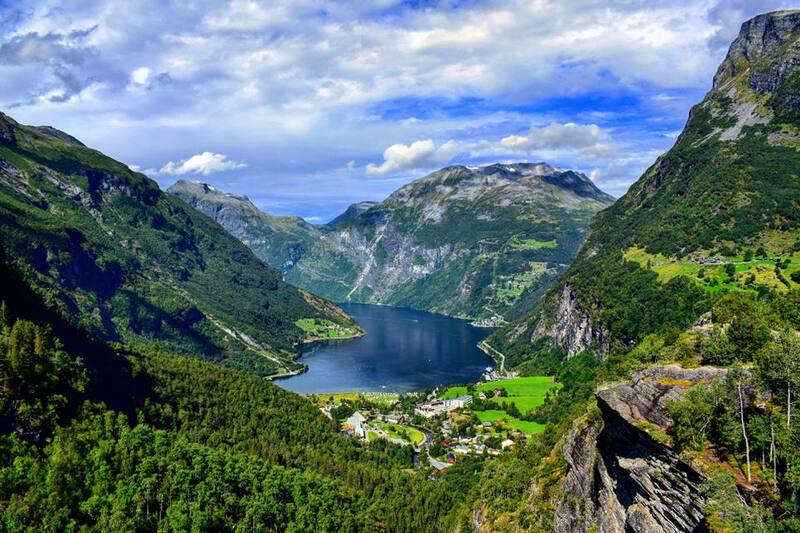 This is one of Norway's must-see destinations.